iPod 2 iTunes allows you to slice and dice your music and bring it back into iTunes any way your wish, by genre, artist, album etc. 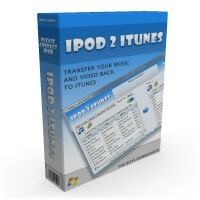 iPod 2 iTunes gives you the peace of mind that no matter what happens to your PC, your music is safely stored on your iPod. Using iTunes alone there is no way to retrieve music stored on your iPod and bring it back into iTunes. This is because iTunes only allows music to be transferred "One Way", from iTunes to your iPod, not the other way around. Only iPod 2 iTunes allows you to slice and dice your music and bring it back into iTunes any way your wish, by genre, artist, album etc. Drag and Drop Songs, Playlists or Video back to iTunes. 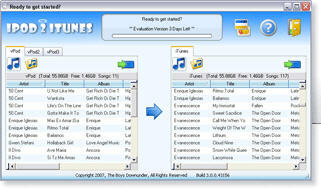 Find duplicate songs within iTunes and remove them quickly. Support for the latest 6th generation iPods.